This breakout board uses Infinion’s IFX9201SG H-bridge motor driver ICs, and can independently control two bidirectional DC motors. 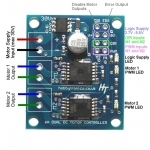 A recommended motor voltage of 4.5 – 30 V and peak current output of 8A per channel (6A continuous) make this a great motor driver for dc motors. 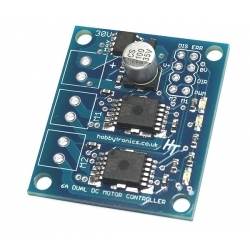 The IFX9201SG MOSFET-based H-bridges are much more efficient than the BJT-based H-bridges used in older drivers such as the L298N and Sanyo’s LB1836M, which allows more current to be delivered to the motors and less to be drawn from the logic supply. 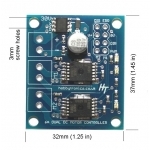 The IFX9201SG IC's can be used with logic inputs of 3.3V and 5.0V (TTL/CMOS-compatible). There is an input pin (DIS) which will disable all motor outputs. 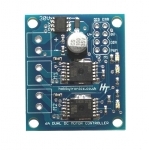 This pin is pulled low by a resistor and must be driven high to disable the motors. In addition there is an error output pin (ERR) which indicates an error condition in the mosfets. This pin goes high when an error is detected and can be connected directly to the DIS pin to shutdown the motors or fed back to the controlling microcontroller. LEDs on the board indicate logic supply voltage and PWM ratios. Blue led is for logic input voltage. 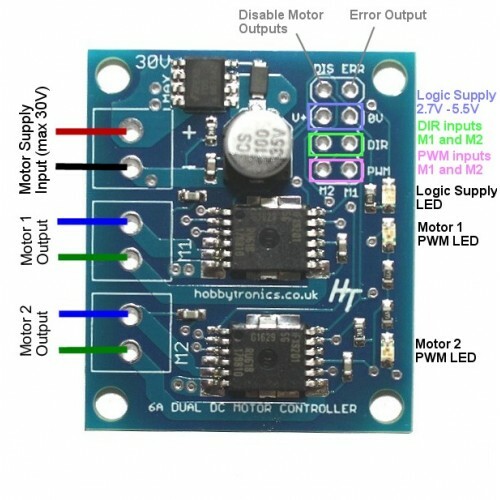 Two green LEDs indicate the PWM ratio for each motor.